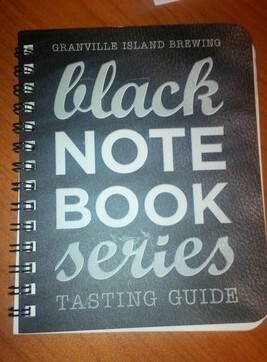 Granville Island Brewing has decided to re-brand their 650ml Limited Release Bomber Series to the “Black Note Book Series”. The Brewmaster Vern has a black note book with his notes and recipes and this book inspired the new direction. In honor of the first release of this re-branding they held a launch party at the Brewery on Granville Island (all Bomber releases are brewed on site on Granville Island!). This invite only event was attended by local bloggers and people in the craft beer industry locally. Steve and I were lucky enough to both be invited! When you checked into the event you were given drink tickets to sample not only the brand new “Cloak & Dagger Cascadian Dark Ale” but also their “Imperial IPA”, “Irish Red” and their “Barley Wine“. 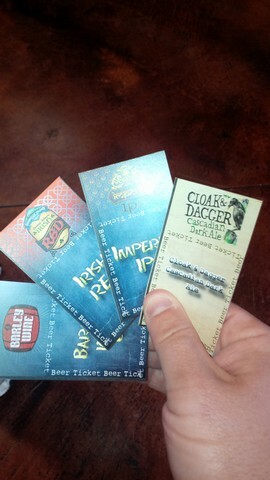 As soon as you walked in you were handed a small approximately 2oz sample of the Cloak & Dagger. Once everyone had arrived Vern called the Room to attention. He explained the ideas behind the re-branding and talked a bit about this first brew in the new series. He also talked about the little note book that everyone at the event would be getting that gives notes on this years “Note Book” releases as well some room to take notes. Another Granville Island Brewing employee took over and expanded the conversation a bit. He even took a shot at Verns drawing skills letting everyone know the new art style is not Verns work (it led to some laughs). One the talking was finished the night moved over to what the night was really about, tasting great beer and discussing it with like minded people. To expand on the great beer being sampled Granville Island Brewing brought in the “Pacific Institute of Culinary Arts” to provide appies that were paired to all 4 brews. The students brought their A game and made some delicious foods that went amazingly with the beer! If this new Cascadian Dark Ale is an indicator of what is to come in the next year then there is reason to be very excited! This brew is amazing and you can tell that Vern is very proud of his creation (as he should be!). The consensus in the crowd was the same as mine with the “Cloak & Dagger”, everyone loved it and could not wait until they could let others know about it! Sadly the Launch Party had to end at some point and it really came to fast. It was great to talk with local bloggers and beer advocates and great to finally meet Vern in person. Keep up the great work Vern! I was also very impressed that GIB handed out Taxi Vouchers to anyone that wanted them! Don’t Drink and Drive! 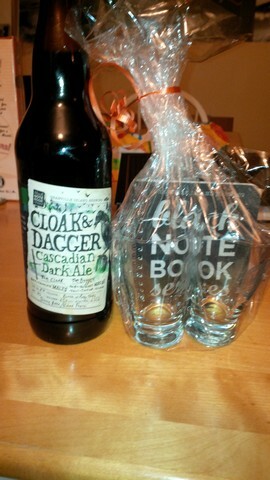 On the way out the door every person that attended the Launch was given a package with a bomber of the CDA a Black Note Book Series Tasting Guide and two small sample glasses both with the new branding! Thanks for the invite Steve and I both really appreciated it and enjoyed the Party. Read the Cloak & Dagger Review Here! This entry was posted in Tasting Event and tagged @picachef, appies, bc, beer, beer launch, brewery, brewmaster, canada, cascadian dark ale, cloak & dagger, cloak and dagger, food, granville island, granville island brewing, launch event, pacific institute of culinary arts, pica, vancovuer, vern.